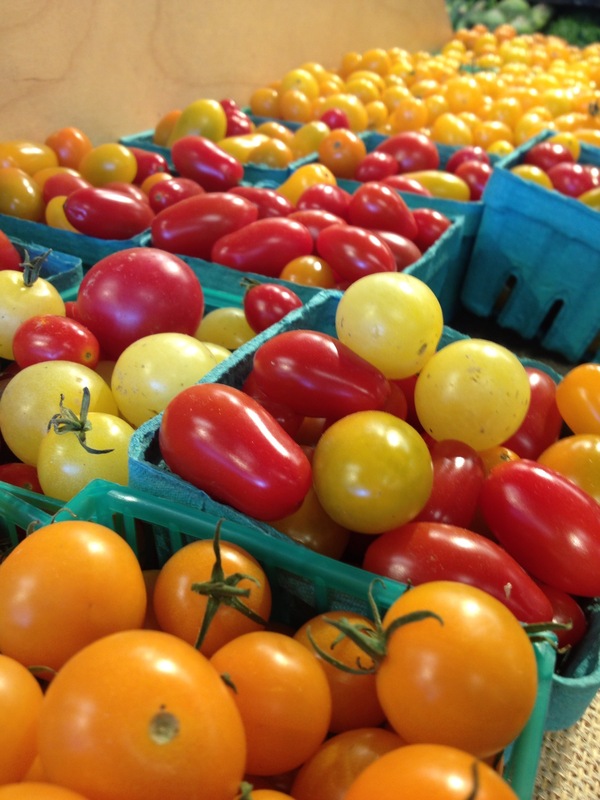 Right now, this very instant, pints of rainbow colored cherry tomatoes in sizes and shapes ranging from gum balls to jelly beans begin appearing in grocery stores and farmers markets. Eaten out of hand they are sweet as candy, and a pint won’t last your car ride from market to home. So get two. I love to roast these gems with a little olive oil and salt then keep in a confit in the fridge. The can used in a variety of ways; from topping canapés or bruschetta, to a quick sauce for pasta- literally tossing hot pasta with the roasted cherry tomatoes, dressing fish roasted meats, or a layer in a sandwich. Roasting a few batches allows you to keep a large stash in your fridge ready at a moment’s notice. Simply preheat your oven to 500 degrees. Line a baking sheet with parchment paper. 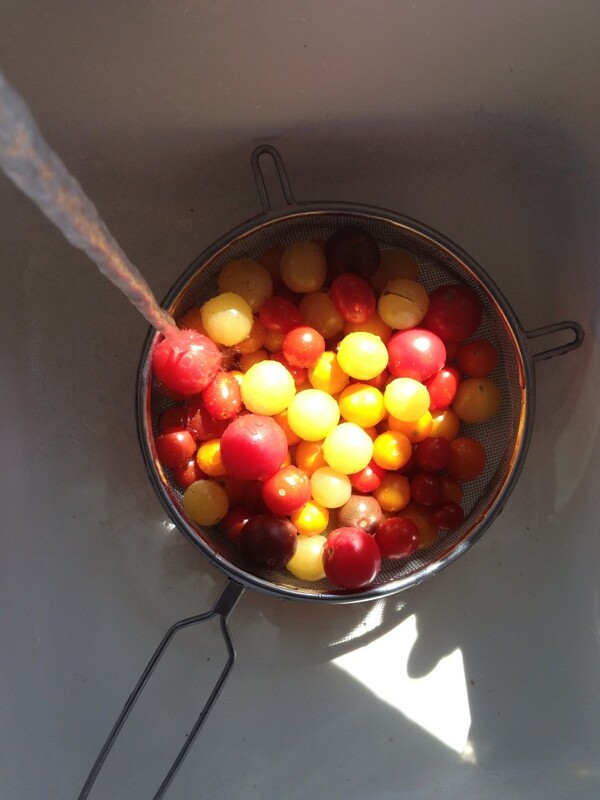 Take a pint or two of cherry tomatoes, give a quick rinse and shake dry. Spread them on the baking sheet and drizzle with some olive oil- not a lot, they shouldn’t be swimming in it, but a good glug or two. Next, sprinkle the lot with some kosher salt. 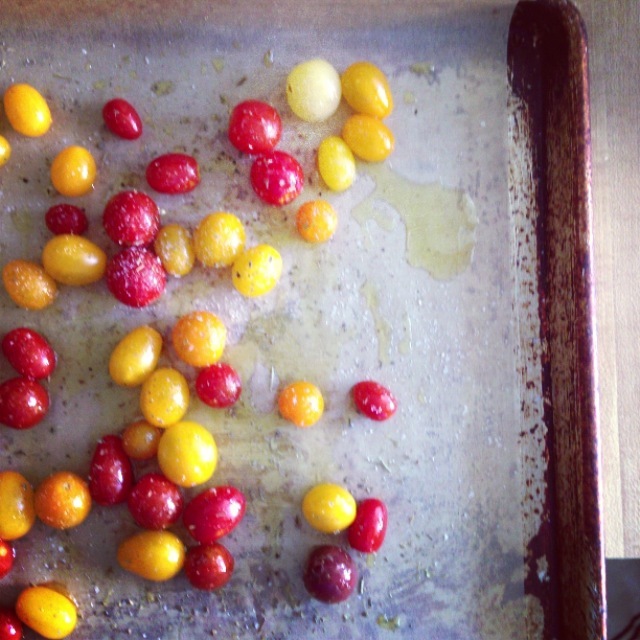 Place tray in oven and roast for 10 minutes, until the tomatoes begin to blister and pop. Remove baking sheet from oven and let cool briefly. Transfer the tomatoes, juices and olive oil to a airtight container and store in the fridge for a week- if they last that long. I also recommend doing this in the morning, unless you are lucky enough to live in a home with central air. Feel free to futz with the recipe, adding whole cloves of garlic, sprigs of rosemary, dried oregano, thyme or other seasonings.